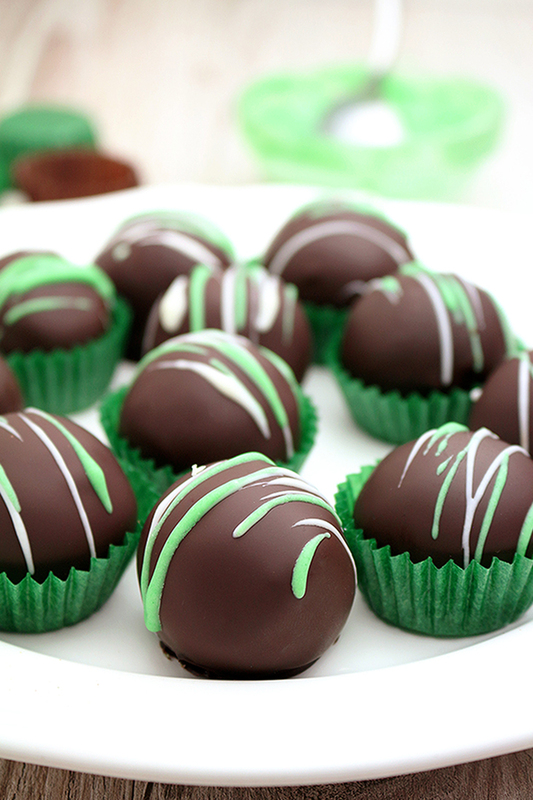 Mint Oreo Chocolate Truffles are simple, quick and so delicious, just perfect for St Patrick´s Day. 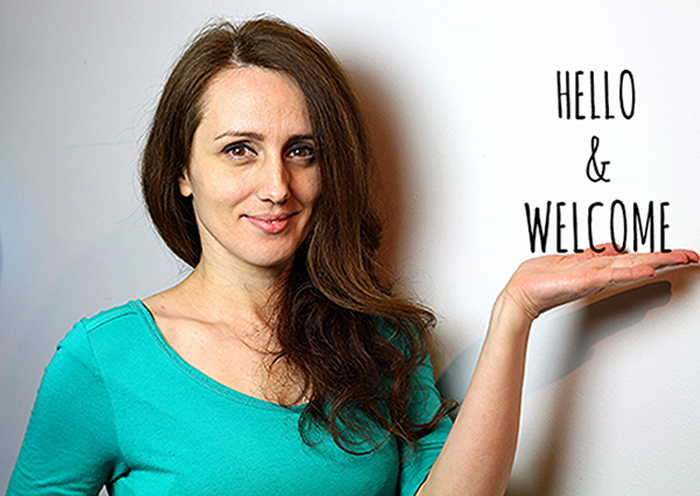 It is going to be here soon, so have you given any thought about what to prepare? Is it going to be something with Bailey´s or Guinness beer, mint… do you like the way mint tastes? If you do, I bet you love Mint Oreo Cookies and mint flavored chocolate, as well. 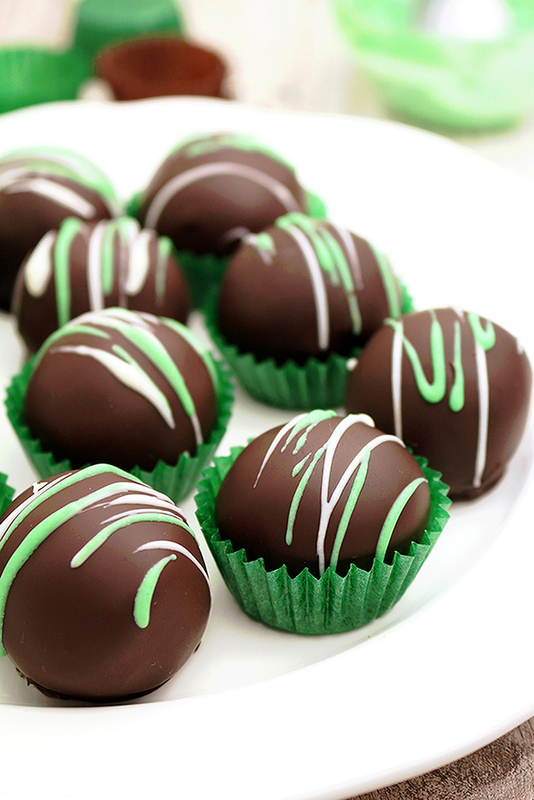 If you like quick and easy recipes and you don‘t like to spend a lot of time in the kitchen, Mint Oreo Truffles are perfect. 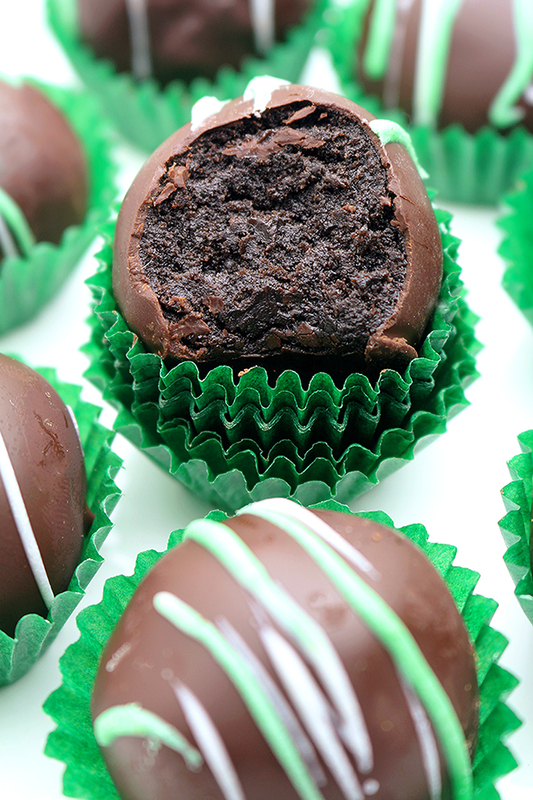 5 ingredients + 35 minutes of your time = Mint Oreo Chocolate Truffles. 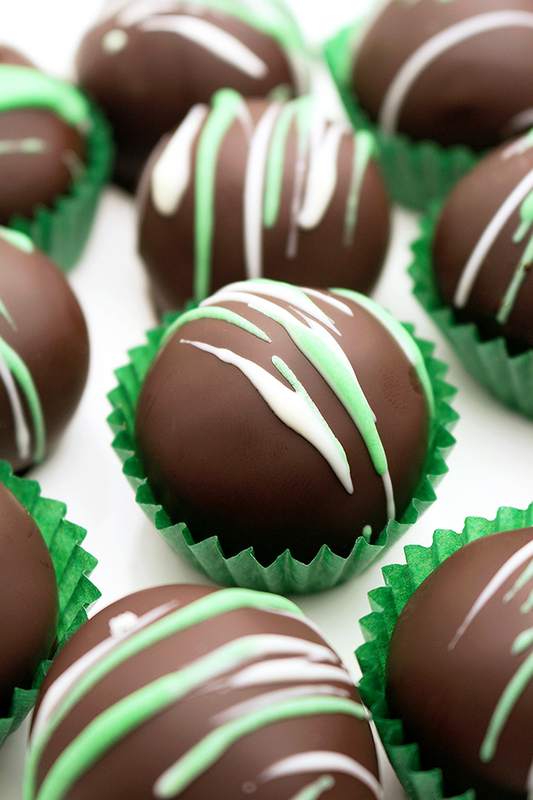 I like simple things, quick and easy recipes, like Mint Oreo Chocolate Truffles, too. 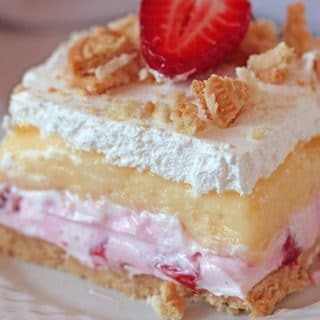 They are delicious and very decorative. They will be a perfect decoration for your dinner table and a real treat for your teeth. Mint extract, green food color can be added into white chocolate…. Have fun and play while preparing these delicious balls. You have many options, the choice is yours. 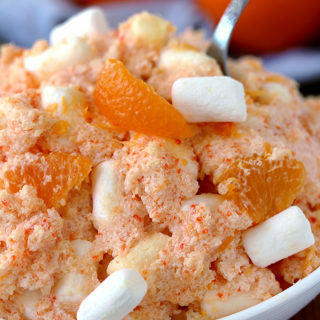 Our favorite combination is given in the recipe. If you still haven‘t decided what to prepare for St Patrick‘s Day, No Bake Oreo Mint Cheesecake is a great choice. If you are a fan of frozen treats, check out Mint Chocolate Chip Ice Cream, too. Green, green and more green… happy St Patrick‘s Day. Enjoy! 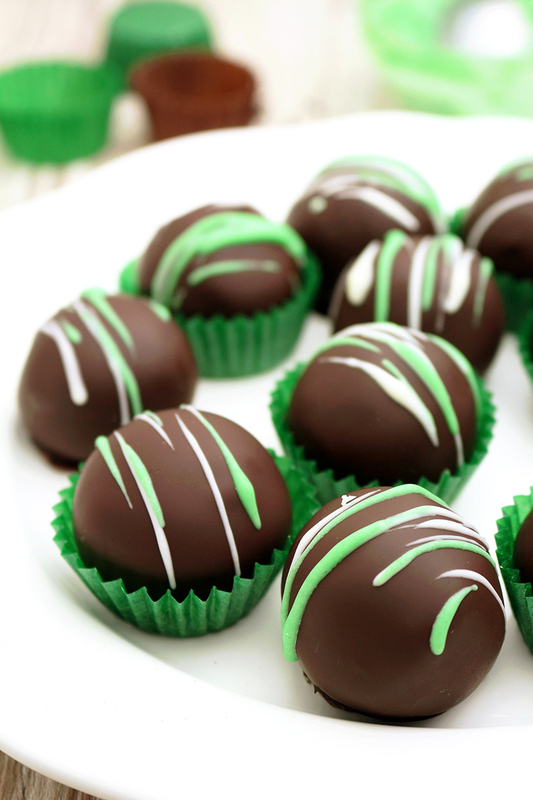 Mint Oreo Chocolate Truffles are simple, quick and so delicious, just perfect for St Patrick´s Day. Put Oreo cookies in the food processor and crumble them. In a large dish put Oreo crumbs and cream cheese and mix with spatula until well combined. Put them on the wax paper. Chill for 20 minutes. While the balls are chilling, melt mint dark chocolate according to the instruction given on the package. Add oil and mix. Put the chocolate into a deeper dish, so that it would be easier to dip the balls. Take the balls out of the fridge. 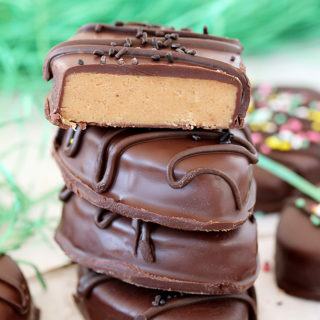 Dip each ball into the melted chocolate and make sure that they are completely covered with it. A fork can help to rotate them. Take the balls out with a fork, shake them and wait for the extra chocolate to drain. Place them on the wax paper. Use toothpick to take the ball off the fork. Repeat the same with the rest of the balls. 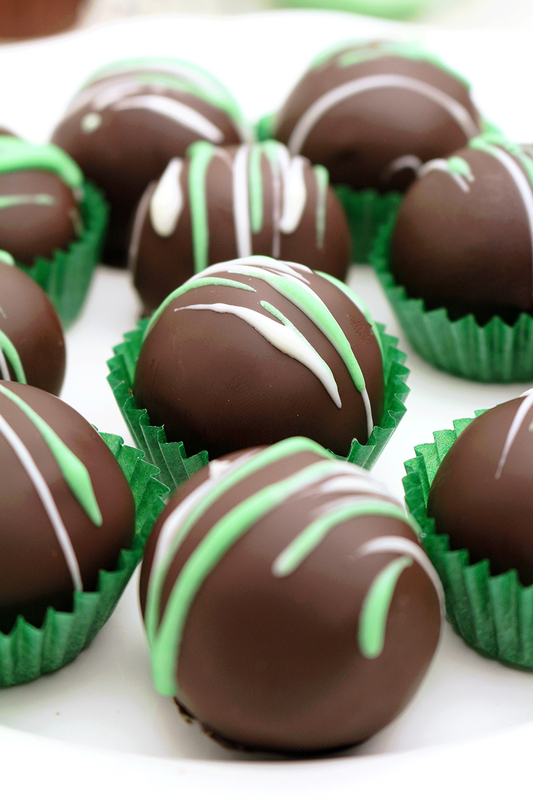 For decoration, melt white and green candy melts and drizzle over the balls. Store at a room temperature in a well sealed container no longer than 3 days, refrigerated up to 7 days.